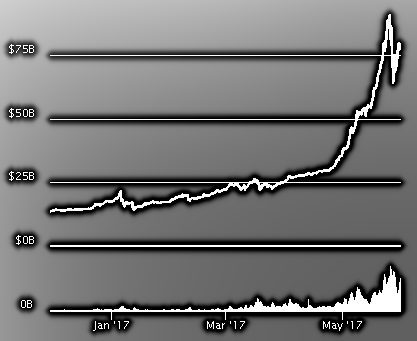 During the last month the market cap of all cryptocurrencies exploded by a factor of three and since the beginning of this year it shot up almost tenfold. This is a digital ten bagger! What is a cryptocurrency or a coin? It is a form of digital “money”. Bitcoin was the first coin and others came later with names like: Litecoin, Ether, Dash, Monero, ZCash, Ripple, and more. Collectively these others are called altcoins. Eventually these coins are just computer generated bytes that miraculously become valuable by a distributed community running blockchain powered nodes over the Internet. This net of bitcoin computers is allocating value to chunks of bytes! Currently all of these coins are “worth” $80 billion. Strange. So, what happened during the last months to the digital currency space? Most notably, bitcoin made new highs after the proposed ETF failed to get approved. It looks like that was the spark that ignited this bitcoin and altcoin rally. As speculated in an earlier post, a disapproval wouldn’t necessarily mean a breakdown of bitcoin’s price. And really, bitcoin managed somehow to overcome this disappointment and make new highs shortly after the SEC decision. Amazingly some altcoins like Ether made an incredible run of factor twenty since this year began. There is a coin that even got multiplied by a factor of hundred. Its name is Ripple and the ripple got inflated to a market cap of $8B right now.